Fears 12,000 home plan on Green Belt will create "Greater Oxford"
"The Oxford Green Belt performs a vital function in protecting the historic character and setting of Oxford, it is not a dumping ground for commuters adding to traffic nightmares. This is political expansionism and nothing to do with meeting housing need, otherwise they would be prioritising sites such as Northern Gateway and Osney Mead for housing rather than jobs. 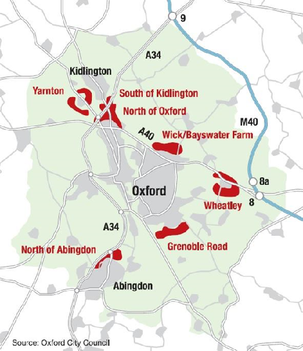 · Coloured in red are sites that Oxford City Council should be developed for housing. COUNTRYSIDE campaigners have claimed plans for 12,000 homes on the edge of the city will lead to a "Greater Oxford". They say the so-called "urban extensions" to the north and south would swallow up surrounding towns and villages and become "a dumping ground for commuters, adding to traffic nightmares". It came after Oxford City Council published a report to argue the case for major developments outside its own boundaries on Green Belt land as a way of addressing the housing crisis in the city. The local authority will use the document as evidence at planning inquiries held by neighbouring councils, which are deciding where to allow housebuilding up to 2031. It said up to 3,600 homes could be built between Oxford and Kidlington, with up to 7,500 also south of Grenoble Road near the Kassam Stadium. – double its original figure. But Helen Marshall, director of the Campaign to Protect Rural England's Oxfordshire branch, said: "The city’s ambitions for a Greater Oxford are finally being laid bare. "The Oxford Green Belt performs a vital function in protecting the historic character and setting of Oxford, it is not a dumping ground for commuters adding to traffic nightmares." "This is political expansionism and nothing to do with meeting housing need, otherwise they would be prioritising sites such as Northern Gateway and Osney Mead for housing rather than jobs. Parish councillors in Sandford and Kidlington said they also feared the developments would reduce the "buffer" between the city and surrounding communities, paving the way for them to become part of it. Maurice Billington, Kidlington Parish Council chairman and a district and county councillor, said: "We do not want to be gobbled up and that is something here people feel very strongly about. "If you join up the village with the city, the next step would be to make us part of it." The "urban extension" proposals were also criticised by John Cotton, leader of South Oxfordshire District Council, who said building on the Green Belt "should be the very last option". The district council has been locked in a dispute with the city council over the Grenoble Road plans for more than a decade. Mr Cotton added: "The Green Belt ensures Oxford is a great place to live by containing the city. "A consequence of building on it would be we end up with a sprawling city that would start to absorb those smaller villages on its outskirts and that changes the nature of the place and makes it less attractive. Although we will look at all proposals that are suggested, the city council needs to do a wholesale review to make better use of the space it has got." City council executive board member for planning Alex Hollingsworth said: "The evidence shows that properly planned urban extensions are the best and most sustainable way to meet the urgent need for more housing in Oxford. Building close to the existing city means that people can use existing public transport and cycle links instead of having to drive long distances to get between their homes and their work”.